The Spirit of Nostradamus had traveled the Earth, observing the past five centuries as a scholar, until I, John Le Sainte, was ready to help fulfill his promise to the world made hundreds of years before, "To Return on the 500th Anniversary of my birth", and "To reveal new psychic predictions to the world"। Nostradamus revealed that his blood passed through my heart as well as the Blood from Ancient Holy French Kings. The 500th Anniversary of the Birth of Nostradamus also coincided with the year that I turned 40, which I was told was also very important. Nostradamus has related his experiences of learning the ways and languages of the world's past and future civilizations by looking through their eyes and listening through their ears over the past 5 centuries. He is fascinated by the advancements in Science and Technology and seems to be quite knowledgeable about modern society. Part One, the First Psychic appearance of the Great Seer Nostradamus to the dreams of John Le Sainte. Part Two, How The Spirit and Soul of the Great Prophet Nostradamus Revealed his true name and Identity to me, John Le Sainte. Interesting Sample Future Prediction as seen, written, interpreted and explained by John Le Saint and Nostradamus. A Nuclear Bomb! A Terrorist Attack! Nostradamus Predictions and Newest Prophecies. Post this Widget on Your Website Free Today! Get the Nostradamus Predictions by Psychic John Le Sainte widget and many other great free widgets at Widgetbox! Please Link to My Nostradamus Predictions Pages and Posts, Please do not copy and paste them. Nostradamus Predictions and Prophecies. Don't Copy! PLEASE Link to Articles of Interest! Nostradamus Messages for You of Future Value! Nostradamus Predictions is the Most Dugg Psychic Website. Please Digg Nostradamus Today! Nostradamus began to reach out my dreams through time in December 2003. At night, The Soul and Spirit of Nostradamus visits me, John Le Sainte, each night in my dreams and teaches me his secrets of Future Prophecy, Astrology, Numerology and True Horoscope Creation. 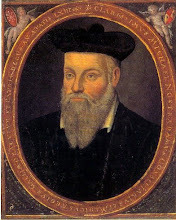 Nostradamus guides me into the future showing me Wars, Floods, Famine, Earthquakes, Volcano Eruptions, Tsunamis and more. I will interpret these dreams for you on my free blog, Nostradamus Predictions,Psychic Future Predictions, and Free Complete Prophecies. Nostradamus has revealed that I, John Le Sainte, am the only true heir to his psychic gift of prophecy. Together we will reveal coming events for the next 500 years and beyond. We will reveal the secrets of the 2012 doomsday predictions they we hear so much about. We will reveal exactly what the 2012 planet alignment truly means to you, your family and the world. What will World War 3 Bring to our world? When and how will World War 3 Begin? Nostradamus knows, and he is revealing all to me, John Le Sainte. Please read my Nostradamus Predictions explained and Interpreted from the Earliest to the very newest to discover many new Nostradamus predictions of the future. Nostradamus asks PLEASE Do not Copy From My Site. PLEASE Link to Articles of Interest! Biography Nostradamus Speaks of His Son Cesar and Famous Painting. Has Nostradamus told us the indentity antichrist? Is Nostradamus the First Urban Legend? Nostradamus Resources on this Wikipedia Featured Wensite are Unequaled in Quality and Controversy!